Welcome To The Best Leveling Guide Out There! And in this article I will be talking about the number one problem of all Runescape players, Leveling. Every RS player wants to level.. And they want to level pretty fast! Some people don’t want to spend hours and days level their character. This is where I come in, Before I put this up on Hubpages I sent it to a couple of friends that played Runescape. I gave them about a week to two weeks and after that time period they said they loved it and it was the fastest Runescape combat leveling guide they have ever used. If your new and you see all the skills you can level up I know it can be confusing, I was. With my guide you will only focus on three skills. These skills go into a class of three things, The are the archer, mage, and the warrior. The warrior main skills are Attack, Strength, Defense, and Hitpoints. If you don’t already know whenever you are fighting your hit points will go up, I just found using these three skills were the fastest leveling. You need to head up to the east Varrock bank. If you follow the path I drew on the map this will lead you to where you need to go. When you're in the building make sure your on the attack that gives you “Attack XP” you can see if it does by hovering your mouse over it. You will need to click every time to attack on these dummies, Well because there dummies they don’t fight back. Train your attack until it is at level 8, When you have gained level 8 attack you should be combat level 5 at least. You are now done with this step and you will not be able to gain exp from attacking the dummies. Go to your spell book and use the spell “Teleport to Lumbridge” There follow the path I give you to the goblins! Switch your attacks so you will be getting “Strength XP” and then go attack the level 2 spiders and goblins. Make sure to pick up everything they drop and bury the bones. Keep attacking goblins until you are at 22 strength, After this switch so will gain “Defense XP” level this to 5 and then back to Attack and level that to at least 10! After you've finished this, You should be level 15! Congrats! Congrats again for reaching level 15! If you have the money or the skill to go and get full steel and a black scimitar go ahead! After you have followed the path I have given you, you will need to raise your defense to 20. After that has been obtained work your attack to 20. After you have reached the desired goals for defense and attack, raise your strength to 25. Make sure not to run out of food, If you run out, stop training and go get some! I don’t want you losing your gear. 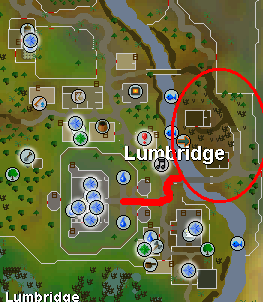 The Closest bank if you have some in there is in the Falador bank that you went threw coming up to the village. You Have Reached Level 25 Congrats! WoW look at you level 25 already! Your character is becoming a lot stronger! At this point if you haven’t already done so I strongly advise that you get better gear. At this level you should buy or make full Mith armor + shield, and I suggest a Mith Scimitar or mith battle axe as your weapon. If you don’t have the money I suggest mining as a way to make fast money! Once you have obtained your gear head to Al Kharid. 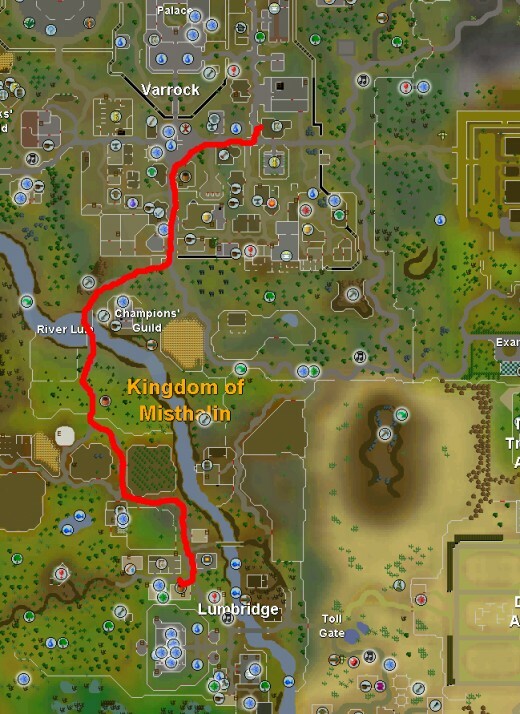 You will have to pay 10gp to pass threw the tollgate unless you have finished the “Rescue Prince Aly” Quest(Quest Guide Coming Soon) Once done this quest you will be able to pass freely. Head to the palace in which you will fight level 9 Al Kharid warriors. “Caution”: When you attack a guard nearby guards will come and attack. So try to fight by a place so where only one can hit you at once. BE SURE YOU HAVE FOOD! This can be a quicker way to gain exp, but also at the same time very dangerous at the same time. Don’t hesitate to run if you are low on health. You should raise your strength to 35, your attack and defense to 30. You Have Reached Level 35 Congrats! I would suggest that you get full Addy armor with an addy weapon. 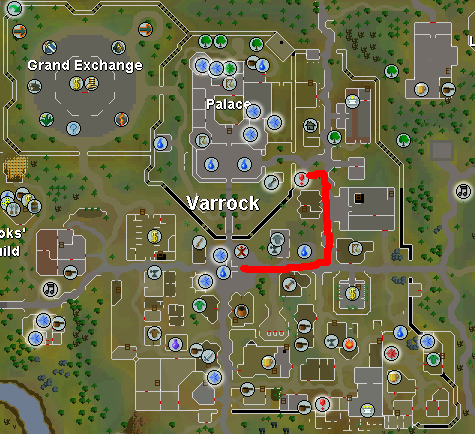 Follow the path I give you to the Varrock sewers. Here you should attack level 18 skeletons which hare just past the zombies, Continue killing these skeletons until you have reached at least level 45. Remember to keep switching between your Attack, Strength, and Defense, Try to keep them as close to level as possible or do as you want to. You Have Reached Level 45 Congrats! Do You Think This Guide Has Improved Your Leveling Ability? Around level 45-60 is where you want to be when you go do Dragon Slayer. 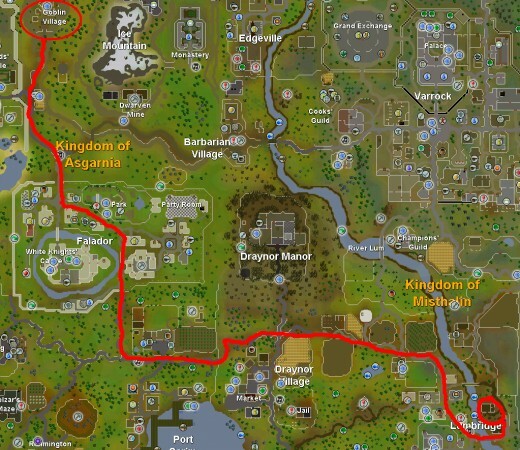 After that you should go to the Varrock sewers no mater what level you are. (Quest Guide Might Be Coming Soon) After you have completed this quest you will be able to wear Rune Platebody. After this quest you should be walking around in full rune! I would concentrate on the moss giants down in the Varrock sewers. Like I said eailier try and get full rune. There are usually a lot of players down there a lot of the time. But Its okay to share the exp. If you don’t feel like sharing try another world. I would suggest building a skill up 5 levels at a time and then switching. I’m proud of you to be reaching jus this far. If you would like another leveling guide to help you from level 60-100 go to my Runescape Leveling Guide Level 60-100. Thanks for checking my guide out. Tell your friends if they need help. If you have any questions or suggestions for future articles or of any articles I have written already please leave a comment or send me an e-mail! ty a lot! This is best guide ever! Believe or not i am from Latvia and reading this guide from my Nokia X3-02! Thank you, and if you add me to RuneScape friends list (xmoneyguide or zukars32) i give you 100k! great job!i went from 5 to 45 it 0.6 day(s)! I found it easy enough to level in the goblin village without food. food would just take up space. if you have full steel and a black weapon, you can get through the goblin village without losing more than 20 hp. THANKS MATE, THIS GUIDE HAS BEEN A BIG HELP WOULD STILL BE LEVEL 5 NOW. where shud i train if my att is 40 str 28 def 35?? i used your guide and i got to lvl 50 then trained on the demon in the wizards tower so now i am level 101! the best thing I can do is you could go and start doing a low level skill to make money and keep working on that until you get the money for the bigger ones. I Do, But Before i Found This Guide, I was randomly hacked for no reason on my account and lost EVERYTHING, so it was like restarting the game. I know you are going to say to make money, I will try, on most things in runescaoe, you have to be a certain skill level to make a lot, and you need money to buy the equipment. i am like level 38 in fishing, but since i got hacked, i can barely afford gear. i have been following your Hub for a very Long Time, But being hacked has made it harder. i still follow it. Latley i have been going up like a level a day. Sinse my account was hacked, i have barely been able to get up levels. i actully, (if u can beleve it) i went back to the begging of the guid, and whent thru it again, and, BOOM!!! LEVEL 45!!! Ive succesfully got to lvl. 24! ive went up 2! if you still have some advice, it would be appreciated! Yeah I think you should be ready, Just bring strength pots, and lots of food to when your fighting her. Good Luck! Hey, I was wondering if you could give me some advice. My char is cbt lvl 50, atk lvl 44, str lvl 42, and def lvl 40. Is it okay for me to do Dragon Slayer, or shoul I train up more? Please respond soon, I want that rune plate! Very Weird, Has anyone else has this problem? Did you follow the guide exactly? I Have Started A New Account And Cant Get Leveled Up Past Like 22. I know This Really Sad Because I Used Your Guide And It Didn't Work. If You Can Help Me Please Post As Soon As Possible. My Name Is The Name I Used To Post This Message. Please Help As Soon As Possible. Currently at level 78. Started 8 days ago today. For the 45 to 60 region. I trained on the hill giants in the dungeon just SW of the Grand Exchange. You can generally find a pretty empty cave on at least a few worlds. Yeah I have Fraps Free Version Didn't know it would work for runescape. For recording, I'd use fraps. No audio capture as it were, but you could just put a voice over and whatnot. Hope You Guys Like The New Guide, Re worded, Pictures to where to go, And I might be making some guides for like Dragon Slayer, And Prince Aly Rescue so you don't need to pay! Also Might be making a guide for every single F2P Quest. When I said 45-60 Is that is around the level you should be to go down here with the way your leveling. After you had finish you equip some Rune plate armor and go fight moss giants. Thanks for pointing that our Kayla :) This was one of my first articles I wrote on here and was when I wasn't very good at typing everything I needed to. I will change that so it doesn't confuse anyone else, And Like I said I will probably be going over this guide I again. Sorry, forgot a question I had..
You have 45-60 and then the Dragon Slayer quest, and then 50-60. I was just curious as to why you skipped 5 levels? Unless the quest gets you up 5 levels, which I doubt, but I'm not sure, since this is my first time playing Runescape. Thanks a bunch! This guide has been really helpful, and I've gotten to 43 so far in a day and a half. You will know that I will be coming back to Runescape to go threw my leveling guide so I'm not telling you the up-to-date leveling process. I will be starting a brand new character and I was wandering If anyone knew of a free desktop recorder that would capture a decent video of me playing runescape, I will be doing Video guides with voice that will be posted on my youtube channel and on the hubs in here. If you have one I would greatly appreciate a link to the site to download. But If I can't find one Ill just not do it, don't get me wrong I would love to do it. If you guys haven't known That I stoped playing Runescape awhile back to start playing WoW and other things, I will be going over these guides some time and making sure there still up to date, And If something is wrong I will be either changing it or making a new guide. On 35-45, what skills do we train? Just switch after 5 each time? You never really put it up, so I'm just confused. This is a good guide for lower level f2p. If your p2p and around 20 cb I would suggest chaos druids. At level 92 with a d scimmy I can make aroun 400k an hour, this of course will not be ad profitable for lower levels. Also if you have around 15 def you don't have to wear armour because the Druids will rarely hit you. Another great place for any level p2p. Is to train at rock crabs. You won't need food at around 15 def. hmm. 100-138 Is Going to Be The Hardest Leveling You will Ever Do In Runescape..
You Can't Really Mess Up When You Hit 100. This Is Where You Can Level Up Any Combat Skill You Want. If You Want To Be Ranger Level It Up, Or You Can Still Do What I've Been Saying, Attack, Strngth, And defence. Before You are At 138 Combat Your, You Might Have To Be Close To Getting 99 Level In More Then 1 Skill. Or Very Close To. Hunter, can you pls make a 100-138 guide? I used both of your guides to get to level 102 but I have a feeling that I will mess up..
You Can Kill Him At as low as i think 32 but its all based on your stats. Jordierox1 Check Out My 60-100 leveling guide, You Would Be Better Off Looking At That. what if we're lvl 73? Your Very Welcome Hunter. I love to Write stuff about World of warcraft. Telling people how to do stuff. Leroyy You have Some Great Hubs There. The Warrior Guides Will Help Me out a lot when playing My toon. Very Nice Hub you Should Check out my Guides on WoW! I use to be a member but i haven't been one for acouble years. hmm im not sure. Are you a member? about ur mining guide where can i mine gold cuz i cant get in crafting guild and rimmington and alkharid low stones away from bank so wat should i do? Your Welcome, If you would like any guides just tell me and i will do my best. manofthejob1 i said you could publish my guides but you have to say there mine and have a link to my hubpages. okay Thanks ill see what i can do. ok thanks for replying and the type of guide would be like a map of it, where the treasure is, the fastest route to it, what monsters are there, just a suggestion. There are goblins Every where threw out Rs. But Yeah If you would like to Fight cows that's okay. What type of guide for the stronghold and the crevice? can i publish ur guides on lvling and the 60-100 lvling guide to my website? lol so you would like to know how to get your attack so you can wield a rune skimmy? Well if you want to keep getting gold and you want to level i would do one day mining and one day leveling or one week leveling like that. Well you could use my 2 guides but you have to say i made it and have a link to them to my hubpages hubs of them please. hey i got a proplem i use rsbots xalo iron miner and banker and it gets me lots of gold but my busy with mining makes me not lvling so wat should i do?also could i use ur 2 comat lvling guides on my website? I cant find the zombies in the sewer. Also how do i make a guide like yours? i promise i wouldn't put the same stuff you put on. the sewers are easy to find. IF you are in the middle of vorrock just go east asn then north till you you a " ! " and then go down there. it will be red ans it's a man whole, you can also look it up on google. i bought brass key and found lvl 28 hill gants is that wat u mean? 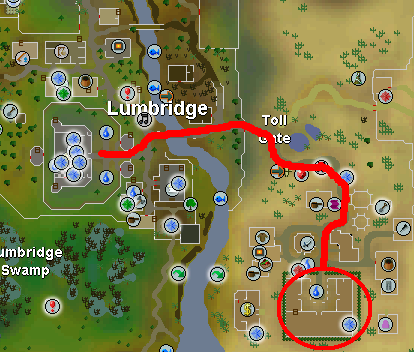 i don't know how to get to varrock sewers for 35-45 could u try to post some pics or give me a link? hmm, Not that i know of all of them are prolly scams. Unless some one gave you there account . i would say just go on with this guide. Or level your skills up but yeah just keep going on the guide. yea um hi.......... you kinda for got about combat level 31-35. No Problem, Glad to help. I remember when i use to hate going out and training for like 3days and getting like 10levels. But once you conpare it to this.. its blown away. I spent a lot of time trying to get it to as fast as it does. i went from 3-40 in 2days its crazy. And remember if you want a guide for anything else. just say it here and i will do my best to get it up. helped me out a lot thanks man i was wondering how they did it so fast!! !